DMIC bringing land grab, loss of livelihood, unemployment, and larger resource grab from commons. Growing inequality and distress as per the corporate agenda. Blooming threat to democratic rights of people in states covered by DMIC. Ghaziabad, Aligarh, Jodhpur, Ajmer, Bhavnagar, and Bhiwadi. Shareholders: DMICDC - Govt. of India – 49%; Japan Bank for International Cooperation (JBIC) – 26%; Housing and Urban; Development Corporation Limited (HUDCO) – 19.9%; India Infrastructure Finance Corporation Limited (IIFCL) – 4.1%; Life Insurance Corporation of India (LIC) – 1%. Pithampur - Dhar - Mhow (IR, 24, Madhya Pradesh). Northern Central Railway; Western Railway; Delhi – Mumbai Rail Route; Ahmedabad – Mumbai and Jaipur – Delhi – Amritsar High Speed Passenger Rail Connectivity through PPP mode. 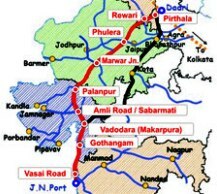 Indira Gandhi Canal, Rajasthan (NW 45); Jawai River, Udaipur, Rajasthan (NW 48); Luni River, Rajasthan (NW 63); Mahi River, MP – Rajasthan – Gujarat (NW 66); Narmada River, Gujarat – Maharashtra – MP (NW 73); Sabarmati River, Gujarat (NW 87); Tapi River, Gujarat (NW 100). Dholera [Greenfield]; Neemrana [Greenfield]; Ankleshwar; Kishangarh; Navi Mumbai international airport [Greenfield]; New Pune international airport. 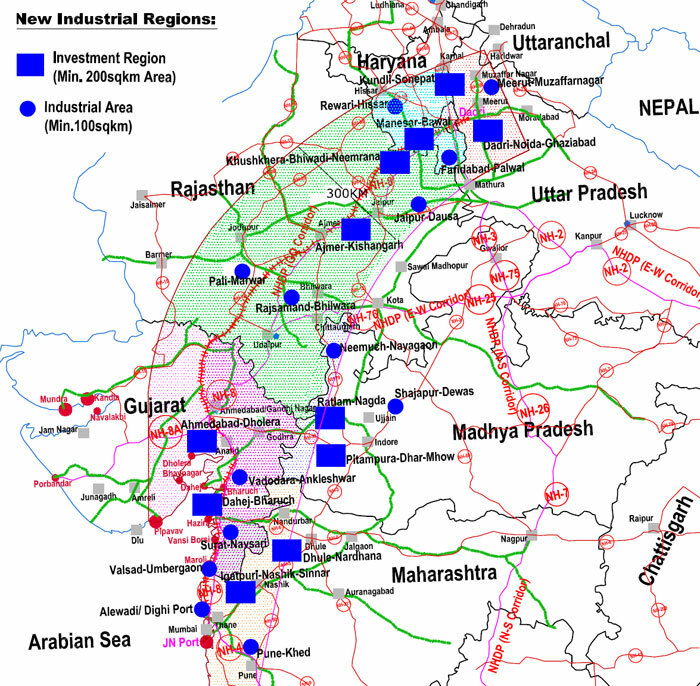 Mumbai; Jawaharlal Nehru Port, Mumbai; Ratnagiri; Magdalla; Hazira; Rewas; Dharamtar; Bhavnagar; and Jafrabad. JNPT and Mumbai port are the major ports. Maharashtra – Maharashtra govt. has decided to develop 07 minor ports viz. Rewas – Aware; Dighi; Jaigad; Anjanwel (Dabhol); Alewadi; Ganeshgule; Vijaydurg; and Redi. Of these, the development of Rewas – Aware; Dighi ports are already in progress through private sector participation. Bandra; Mora; Rajpuri; Ratnagiri and Vengurla. Simar; Mithivirdhi; Vansi Borsi; Maroli; Bedi; Alang; Jageshwar (Dahej); Bhavnagar; Mahuwa; Navlakhi; Veraval and Mandvi. 1. Panvel (Ulwa – Belapur) – Gujrat Ambuja Cement Ltd.
2. Dharmatar – Ispat Industries Ltd.
3. Revdanda – Vikram Ispat Ltd.
4. Ratnagiri (Pawas – Ranpar) – Finolex Industries Co. Ltd.
3. Mundra – Adani Ports Ltd.
Okha; Porbandar; Navlakhi; Rozi / Bedi; Bhavnagar; Mahua; Alang; and Dahej [Mainly in the Gulf of Kutch and the Gulf of Cambay]. Rajasthan Atomic Power Plant – Total Installed Capacity: 1180 MWe (existing) + 1400 MWe (Proposed); Water Requirement: Source of Water: Rana Pratap Sagar Dam and Gandhi Sagar Dam. Tarapur Nuclear Reactor – Total Installed Capacity: 1400 MWe (existing); Source of Water: Sea Water. 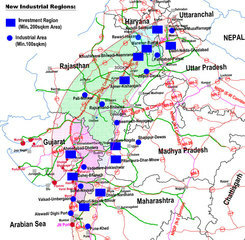 For more details, Please refer to Dossier on Industrial Corridors in next section. Due to agitations, the status of outcomes are different at different places. At some places its put on a hold, in others work is continuing and so on. 5 true stories from the project that never made it to headlines.